Overnight camp is a place for kids with food allergies to gain independence and self advocacy skills. This opportunity is only made possible by the wonderful camp owners and directors that have created safe environments — a second home for so many kids. To make our top food allergy-friendly list we searched for camps that train their staff to use auto-injectors, take special precautions in the kitchen to reduce cross-contact, keep common allergens out of cabins and have a responsive medical team on site. At Camp Evergreen and its brother camp, Camp Kenwood, about 1 in 10 campers has a food allergy or special diet. They don’t allow foods that contain peanuts, tree nuts, sesame, peanut oil and certain seeds. Evergreen inspects every label, works closely with food distributors, and prepares only nut-free food to make sure campers are safe. On Staff: They have a full-time chef who cooks individual meals for those with food allergies. In the kitchen, she uses a special set of bright purple cookware to prepare meals, which cuts down on cross-contact risks. This family-owned camp in the Adirondack mountains goes the extra mile to accommodate girls with food allergies and special diets. They have a nut-free policy that prohibits peanuts and tree nuts from entering the camp environment. In the kitchen, special gluten-free meals are made in a clean kitchen before the rest of the food prep begins. On Staff: They have a chef dedicated to campers with food allergies or dietary restrictions, using color-coded utensils and cutting boards while cooking. Once it’s ready, the food is covered, labeled and stored in a separate location. A doctor and four nurses are also on staff. Timber Tops and its brother camps, Lake Owego and Pine Forest Camp, work diligently to keep campers with food allergies safe. The dining hall staff is trained to use separate equipment when needed. They do not serve peanuts, tree nuts or products that list nut ingredients, but the camp is not considered “nut-free” since it is still phasing out a few products made in facilities with nuts. On Staff: They have a nutrition specialist on staff who helps campers find safe options, and all staff members are trained to use epinephrine auto-injectors. There are also three nurses who live on the grounds and are available 24 hours a day. Camp Wicosuta recently took major steps to be more food allergy-friendly by adopting a nut-free kitchen. They don’t serve any products containing nuts, and at the weekly Snack Shack, campers can choose from a variety of nut-free candies. Staffers are trained to use auto-injectors, and they keep extras on hand in the infirmary. On Staff: They have a chef who makes meals for campers with food allergies and intolerances in a separate area of the kitchen. Five nurses and one nursing student are on staff with a local pediatrician available on an as-needed basis. Located in the Berkshire Mountains of western Massachusetts, Camp Greylock hasn’t served nuts in the dining hall for more than a decade. The kitchen has a separate cooking area, prep station and serving station for those with food allergies and special dietary needs. Currently, they have campers who are allergic to nuts, milk, eggs, gluten, fruit, fish, seeds and more. On Staff: On the medical team, there is a doctor, multiple nurses, two athletic trainers and Michael, the camp owner, who is a former paramedic and active member of FARE. At Camp Kenwood and its sister camp, Camp Evergreen, about 1 in 10 campers and counselors has a food allergy or special diet. They don’t allow foods that contain peanuts or tree nuts (including sesame, peanut oil and certain seeds). Evergreen inspects every label, works closely with food distributors and prepares food that typically contains seeds or nuts in-house to make sure campers are safe. Staff: They have a full-time chef who cooks individual meals for those with food allergies. In the kitchen, she uses a special set of bright purple cookware to prepare meals, which cuts down on cross-contamination risks. Lake Owego and its sister camps, Timber Tops and Pine Forest Camp, work diligently to make campers with food allergies feel safe. The dining hall staff is trained to use separate equipment when needed. They do not serve peanuts, tree nuts or products that list nut ingredients, but the camp is not considered “nut-free” since it's still phasing out a few products made in facilities with nuts. On Staff: They have a nutrition specialist on staff who helps campers find safe choices, and all staff members are trained to use epinephrine auto-injectors. There are also three nurses who live on the grounds and are available 24 hours a day. At Camp Winadu, food allergic campers are in good hands. The camp is nut-free and committed to using products that are not processed in facilities with nuts. They require staffers to carry extra auto-injectors in their backpacks, whether they’re on the grounds or on a field trip. There’s no canteen, but if campers are treated to snacks or desserts, the chefs will try to replicate the sweets for boys with food allergies so no one feels left out. On Staff: Not only is there a separate allergy kitchen and special chef, there is also an allergy counselor assigned to every camper with food allergies. There are six nurses and one doctor on staff. Raquette Lake Camps is an authority when it comes to food allergies. With a director who has a tree nut allergy and a long history of allergy awareness, the boys and girls camps are in good hands. All food at the camp is completely free of peanuts, tree nuts and legumes, and their Food Service Director works all year long to plan food allergy-friendly meals, making sure no products with cross-contamination warnings enter the facilities. Parents are permitted to send separate cooking utensils, small appliances or gluten-free graham crackers for s’mores if necessary, but no packages are allowed to be sent to campers, eliminating any risk of outside food coming into the camp. On Staff: Both the boys and girls camps have four nurses, a medical director and a doctor staffed in the infirmary. Camp Modin, the oldest Jewish summer camp in New England, is completely Kosher and conscious of common food allergies. They don’t order or serve products that contain nuts of any kind, and they offer gluten-free options at every meal. On Staff: All staffers also attend workshops about food allergies where they learn to use auto-injectors, and there are on-site nurses available 24 hours a day. At Camp Wingate, just 60 miles north of Montreal, the staff takes food allergies very seriously. This is a peanut- and nut-sensitive camp, and campers are allowed to bring one grocery bag of peanut-free food from home. Staff members examine every label to make sure nothing comes on the campgrounds that could be harmful to those with nut allergies. On Staff: Two nurses and a doctor are on the premises 24 hours a day. Camp Emerson sets the standard for food allergy-friendly overnight camps, even billing themselves as the “food allergy specialists.” Sue, the camp director, has an egg allergy, and she’s taken steps to make Camp Emerson completely peanut, tree nut, shellfish and sesame free. They also support those with Celiac disease and EoE. Approximately one third of campers and staff members have food allergies, helping kids feel understood and safe. On Staff: There is a team of registered dietitians on staff who prepare each child’s menu. At Camp Laurel, food allergic campers can find safe options in the dining hall, on field trips and around the campfire. The kitchen is nut-free, although they do use some products that are processed in facilities with nuts. With 30 auto-injectors on the grounds, you can’t go far without being near one, and staff members are trained to administer them. On Staff: A special task manager makes meals for those with food allergies, and the infirmary is staffed by nurses, nursing assistants and a doctor who lives on the grounds. Campers with allergies are in good hands at Camp Pontiac, a camp owned and operated by two pediatric ear, nose and throat specialists. The camp is completely nut-free and seed-free, and there’s a separate area of the dining hall where campers with food allergies or gluten sensitivities dish up their food. On Staff: One of the camp owners, a doctor and more than 10 nurses are always on the grounds. This 100-acre camp in the Berkshires stands out with a food allergy coordinator on staff who prepares meals in a separate area of the kitchen for campers with food allergies. When a food allergic camper leaves the grounds, a special lunch (and an auto-injector) is packed. On Staff: Five nurses are on staff, one of whom lives and works at the camp and trains every counselor to use auto-injectors. There is also a pediatrician on staff. Campers and staff come from all over the world to attend Lake of the Woods Camp or The Glen, a two-week experience at the same facility. Lake of the Woods is peanut and tree nut-aware, meaning they do not use products that contain nuts. The camp does everything they can to ensure the safety of their campers and the peace of mind of parents. Before camp begins, parents can get a copy of the menu and list of canteen items, which gives them an opportunity to ask questions or customize meals or snacks. On Staff: In the kitchen, they have a designated chef who prepares allergen-free meals for campers with soy, dairy, egg, gluten or multiple food allergies. Nine nurses live on the campgrounds. Birch Trail Camp, one of the country’s premier wilderness programs, is a nut-free camp, and this summer, they stopped using any products made in facilities that process nuts. At mealtime, they have many vegetarian, dairy-free, gluten-free and allergen-free options. There is no food allowed in the cabin, except on arrival day when the girls have a “candy party” in their bunks. Counselors will check the candy for nuts before the parties begin. On Staff: The chefs, experienced school cooks who use separate cutting boards and utensils to prepare these meals, can accommodate most food allergies. There are three nurses who live on-site, and a different camp doctor is available every week. Located in the Northwoods of Wisconsin, Camp Marimeta emphasizes a safe and caring atmosphere where campers with food allergies can flourish. They consider themselves a “nut aware” camp with many food allergic campers attending every summer. There are no peanuts in the mess hall, and if a dish with nuts is on the menu, a special announcement is made. There are products containing nuts in the canteen, but staff members can help campers find safe choices. On Staff: There is a designated chef in the kitchen who prepares gluten-free and allergen-free meals in a separate area, reducing the risk of cross-contamination. There are two nurses on the campgrounds at all times. More than a sports camp, Greenwoods emphasizes teamwork, character development and inclusion. Campers come from all over the country to attend Greenwoods or The Grove, a two-week experience at the same facility. They are peanut and tree nut aware, meaning they don’t use products that contain nuts. The camp does everything they can to ensure the safety of their campers and the peace of mind of parents. Before camp begins, parents can get a copy of the menu and list of canteen items, which gives them an opportunity to ask questions or customize meals or snacks. On Staff: They have a designated chef who prepares allergen-free meals for campers with soy, dairy, egg, gluten or multiple food allergies. There are nine nurses who live on the campgrounds, and they train counselors of food allergic campers to use auto-injectors. 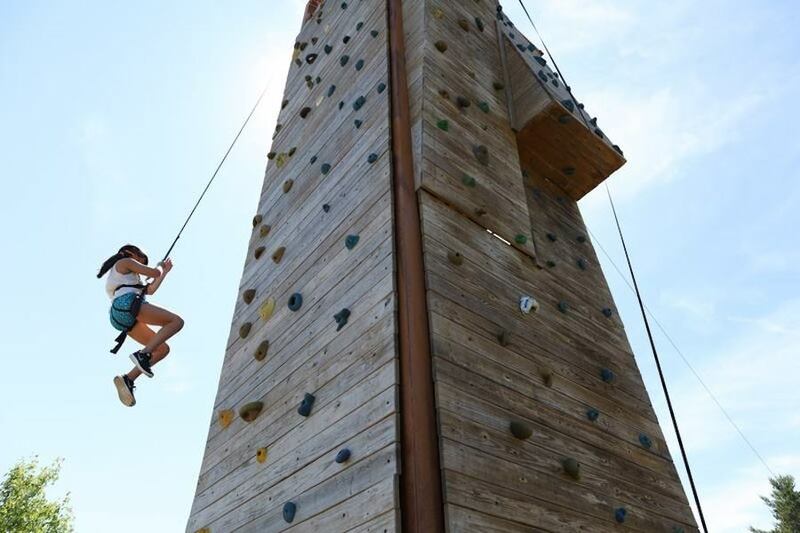 Camp Horseshoe offers premier athletics, outdoor adventures, water sports and more. With at least a dozen boys with nut allergies at Horseshoe each summer, they have a completely nut-free kitchen and don’t allow any food in the cabins. If additional medical attention is needed, there is a hospital 15 minutes away. On Staff: They have three nurses on staff, and all counselors are trained to administer auto-injectors. Located on 120 acres along beautiful Northwoods shoreline, North Star offers a rich variety of activities and experiences designed to stimulate the imagination and challenge campers. North Star is a nut-free, peanut-free camp that uses sunflower butter in place of peanut butter. Twice a week, the boys get candy bars as treats, but all are individually wrapped and the nut-free candy is kept separate from the others. On Staff: The well-trained kitchen staff is aware of all dietary restrictions, and they will happily prepare an alternative meal for campers with food allergies and serve it at a separate window. Two nurses live on-site, and the closest hospital is 30 minutes away. Camp Ojibwa provides young men a home away from home and a brotherhood based on kindness, respect, fair play and trustworthiness. Ojibwa is completely nut-free, and the staff has decades of experience accommodating food allergic campers. Their chef prepares customized meals for those with food allergies, all staff are trained to administer auto-injectors and the whole camp maintains an attitude of inclusion for all food allergies. On Staff: An exceptional ear, nose and throat doctor with a food allergy specialty has been working at the camp for decades, making it easy for campers to get personalized care year after year. There are several nurses on staff 24/7. Young adventurers can sign up for Hollywood stunt lessons, take a turn on a flying trapeze or perform in the rock star showcase at Pali. This nut-free camp screens all products used in the kitchen to make sure they aren’t processed in the same facilities as nuts. With advance notice, they say they can accommodate all food allergies, and the head counselors will ensure the kitchen has separate cooking equipment if necessary. On Staff: The staff undergoes an intense two-week training session, which includes administering an auto-injector. Their infirmary is staffed by nurses, and the closest hospital is just 10 miles away. Located on 160 acres just outside Yosemite National Park, this Jewish summer camp has been in operation since 1925. They keep a Kosher kitchen and are nut aware, meaning they do not bring nut products or foods made in the same facilities as nuts into the camp. They have many campers with severe allergies and dietary restrictions, and all vegan, gluten-free and allergen-free meals are prepared in their alternate foods kitchen. On Staff: All staff members are trained to use auto-injectors, and the on-site medical team includes an RN, medical assistants and a doctor. At Camp Blue Spruce, the mission is clear. Organizers strive to provide children with food allergies “a summer camp experience where they can be independent, confident and carefree.” This camp is free of most common allergens - including dairy, eggs, peanuts, tree nuts, fish, shellfish, wheat, soy, gluten and sesame - yet the kitchen staff still manages to make tasty meals like BBQ and tacos. There’s even offer allergy-friendly whipped cream for the apple crisp! On Staff: Staff members are trained to identify and treat allergic reactions, and the medical advisory team includes some of Oregon’s top allergists.